The Pew Research Center came out with a finding the day after the election. According to this report, “White, born-again/evangelical Christians,” voted for Trump in monumental numbers. He received 81% of their vote, which was more than Romney received in 2012. Sadly, far too many of Trump’s proposals resemble the ideas and techniques of history’s worst autocrats. They have nothing to do with the universal, compassionate, social justice based ministry of Jesus of Nazareth. Talk of Muslim registries, deportation squads, border walls, legalized torture, arresting flag burners, proliferating nuclear weapons, threatening political opponents, undermining free press, demeaning the disabled, pillaging the earth for material resources, encouraging cyber attacks, and generally dividing human beings into artificial categories in order to confuse and manipulate them, are all recycled moves from the playbook of yesterday’s tyrants. 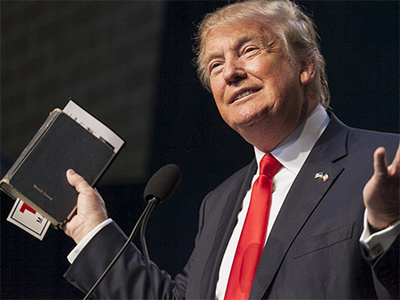 Given what Trump has done with his fortune and fame-and what he has tried to carry out in his first 30 days- makes what he says about Christianity seem hypocritical and contrived. With these words in mind, it is painfully evident that President Trump has already begun to institutionalize his version of Christianity as the national religion. This should alarm anyone who values the separation of Church and State. It should also alarm anyone who knows that Christianity is powerful because it is a religion established for minorities surviving on the margins of empire. It is not what Trump declares to be. During a campaign stop in Iowa, candidate Trump said, “I’m a true believer. And you’re many true believers — I hope all — is everybody a true believer in this room? I think so. But Christianity is under tremendous siege…The power of our group of people together, I mean, if you add it up … it could be 240, 250 million. And yet we don’t exert the power that we should have. Now, I think some of the churches are afraid of their tax status, to be honest…But you know the fact is that there is nothing the politicians can do to you if you band together. You have too much power. But the Christians don’t use their power,” Trump said. “We have to strengthen. Because we are getting — if you look, it’s death by a million cuts — we are getting less and less and less powerful in terms of a religion, and in terms of a force,” he continued.